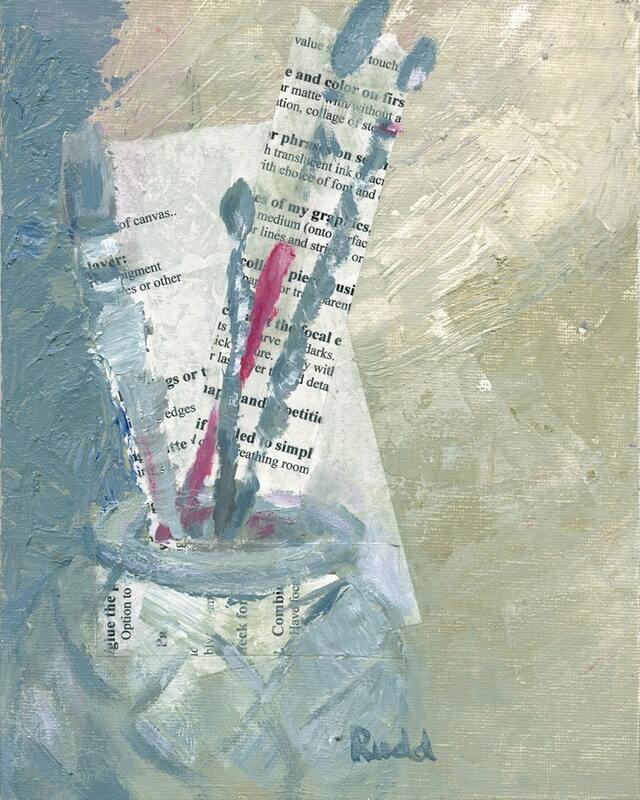 A pottery vase holding a bouquet of paintbrushes overlays the artist's notes about the mixed media painting process. This image might speak to anyone who enjoys the moods of contemplation and introspection that occur during any creative process or during life in general, any work in progress. The original painting won first place in a regional juried competition in Charlotte, North Carolina. This is a high quality reproduction of the original acrylic painting. Image was professionally captured with state of the art light and camera equipment, 2400 dpi, 16-bit imaging, and printed on archival paper with Pigment Archival ink. This print will not fade or yellow. OTHER SIZES ARE AVAILABLE up to 16 x 20 in, $150.